The round containers positioned & accurate spacing between two containers by the roller spacing device for wrap-around operation at the operation at the labeling point, an electronic product sensor senses container & release a label from self adhesive label roll. 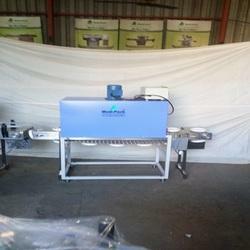 If machine is equipped with batch printing device in that case batch printing device prints the batch no. & other matter on label during label is stationary means time between sensing of two label. The sensed round container moves on conveyor sticker label at labeling point wrapped around to container. Then the labeled container moves further through a rubber pressing belt & stationary rubber pad that ensures neat & perfect fixing of label. 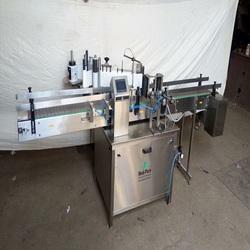 Automatic Self Adhesive (Sticker) Labeling Machine offered comes with advanced PLC control as well as display screen support that makes it easy to handle operations. Further, the all stainless steel finish and independent working of each labeling head also make these deliver optimum performance. 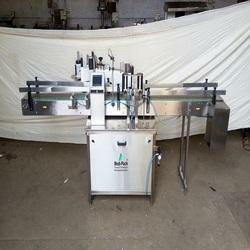 Some of its features include suitable for uneven surfaces labeling, can be provided with optional ribbon coding machine for printing date on label, suitable for handling labels like self-adhesive labels, bar code and others, suitable for use in industry sectors like pharmaceutical, food, cosmetic and other industries. Air Pressure : Minimum : 6 bar pressure 2 CFM for printing device. The Automatic Vertical Sticker Labeling Machine MPASAL-150TF is one of the most users friendly. 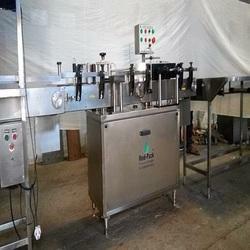 The machine is used for two sides labeling on flat surface of different size of flat container. 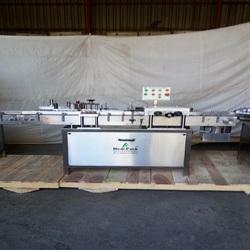 It is capable to labeling up to 150 containers per minutes depending on products and label size. The automatic model is equipped with belt spacing device resulting in a simple to “No change parts required”. The round containers positioned curate spacing between two containers by the belt spacing device and a belt drive mechanism hold the container from top of the container for two sides labeling on flat container at the labeling point, an electronics product sensor sense container relies a label from self adhesive label roll. If machine is equipped with batch printing device in that case batch printing device prints the batch no. other matter on label during label is stationary means time between sensing of two label. The sensed round container moves on conveyor sticker label at labeling point wrapped around to container. Then the labeled container moves further through a rubber pressing belt stationary rubber pad that ensures neat perfect fixing of label. Suitable for any type of Flat Container. Container hold from top for perfect accurate labeling. PLC with Soft Key Pad System. Servomotor instead of steeper motor. Capacity Output/Hour - 3600 to 9000 Nos. Output/Hour : 3600 to 9000 Nos. 6V DC / 40 Kgs. x 2 nos. • Suitable for any type of Flat Container. • Container hold from top for perfect accurate labeling. • Stainless steel 304 construction. • Full Security Package including counter. • PLC with Soft Key Pad System. • Product data storage Facility. • No change parts requirements. • Very less down time for change over. • Suitable for Glass, Plastic, Pet, Tin, Corrugated containers. Capacity Output/Hour* 3600 to 9000 Nos. 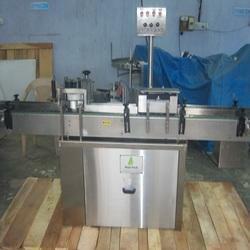 Description : The Automatic Vertical Sticker Labeling Machine MPASAL-150 is one of the most user friendly. 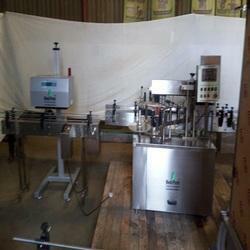 The machine is used for full/partial wrap around labeling on different size of round container. 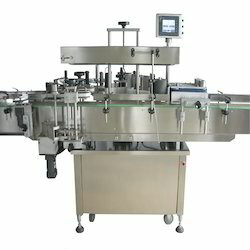 It is capable of labeling up to 150 containers per minutes depending on products and label size. The automatic model is equipped with roller spacing device resulting in a simple to “No change parts required”. Operation : The round containers positioned & accurate spacing between two containers by the roller spacing device for wrap-around operation at the operation at the labeling point, an electronic product sensor senses container & release a label from self adhesive label roll. If machine is equipped with batch printing device in that case batch printing device prints the batch no. & other matter on label during label is stationary means time between sensing of two label. The sensed round container moves on conveyor sticker label at labeling point wrapped around to container. Then the labeled container moves further through a rubber pressing belt & stationary rubber pad that ensures neat & perfect fixing of label. 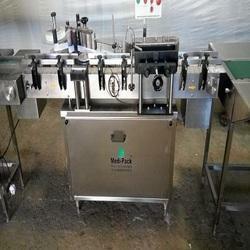 Flat Bottle Labeling Machines offered comes backed by latest technology support and allows handling of different size inner and outer diameter labels. Further, the system delivers label precision of ±1mm. 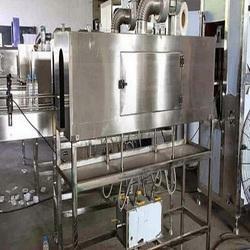 Some of its features include production capacity of 20 to 300 bottle per minute, power supply of 220V-50Hz/60Hz, advanced PLC control system for precise operations, support of high functioning photoelectric device and variable speed motors, machine suitable for easy adjustment, machine designed to meet GMP standards, suitable for use in industry sectors like chemical, food and others. 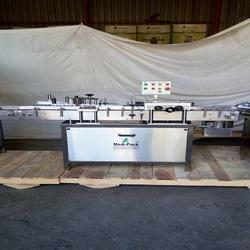 We are offer Electrical Heating shrink Tunnel with S.S Conveyor 7 Feet Long , Conveyor with Ac feq. 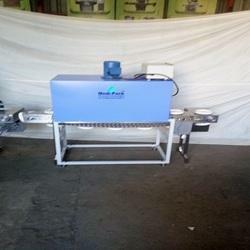 Drive to Decrese and Increase speed of Conveyor .The Operation of this Machine is Manual put sleeve on Bottle one by one after capping ,than Bottle Move on Conveyor and go in the Shrink Tunnel One by one and to make perfect shrink . We are offer Electrical Heating shrink Tunnel with S.S Conveyor 7 Feet Long , Conveyor with Ac feq. 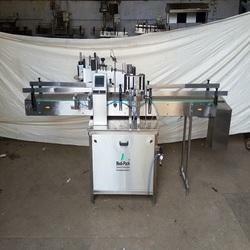 Drive to Decrees and Increase speed of Conveyor .The Operation of this Machine is Manual put sleeve on Bottle one by one after capping ,than Bottle Move on Conveyor and go in the Shrink Tunnel One by one and to make perfect shrink . 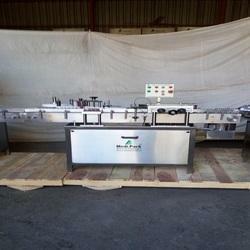 We are offer Electrical Heating shrink Tunnel with S.S Conveyor 7 Feet Long , Conveyor with Ac feq. Drive to Decrease and Increase speed of Conveyor. 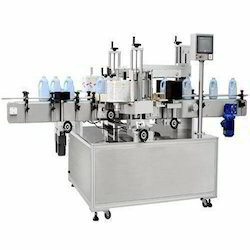 The Operation of this Machine is Manual put sleeve on Bottle one by one after capping ,than Bottle Move on Conveyor and go in the Shrink Tunnel One by one and to make perfect shrink .